Home/ About Us/ Subsidaries/Shanghai Ya Li Ready-mixed Concrete Co., Ltd.
Shanghai Ya Li Ready-mixed Concrete Co., Ltd.
Shanghai Ya Li Ready-mixed Concrete Co., Ltd. (the “Company”) was established in November 1995 by Asia Cement Corporation and Oriental Holding Co., Ltd, both of which are subsidiaries of Far Eastern Group in Taiwan. With a registered capital of US$15 million, the Company is a sole proprietorship funded by Taiwan-based Far Eastern Group and the first enterprise invested by Far Eastern Group in Mainland China. The Company has two concrete mixing plants and a cement silo terminal. One of the concrete mixing plants was originally completed and commenced operation in March 1997, with a cumulative amount of 3.32 million m3 of commercial concrete produced and sold by the end of 2011. In 1997, the plant was awarded the title “Sophisticated Mixing Plant in Shanghai” by the Shanghai Municipal Construction Commission, and in 1998, it was named “Advanced Building Materials Quality Management Company in Shanghai” by the Shanghai Municipal Construction Industry Administrative Office. In April 2007, owing to the World Expo, the mixing plant was relocated to Tangkou Pier of Nanpu Branch Company of Shanghai International Port (Group) Co., Ltd. at No. 200, Alley 301, Tangpu Road, Pujiang Town, Minhang District, and is now known as Tangkou concrete mixing plant. With a site area of 9,000 m2, the plant has two 3 m3 mixers, 30 mixer trucks and one 45m truck-mounted boom pump. The plant covers most of the areas in Pudong New District, Minhang District, Nanhui District and Fengxian District. 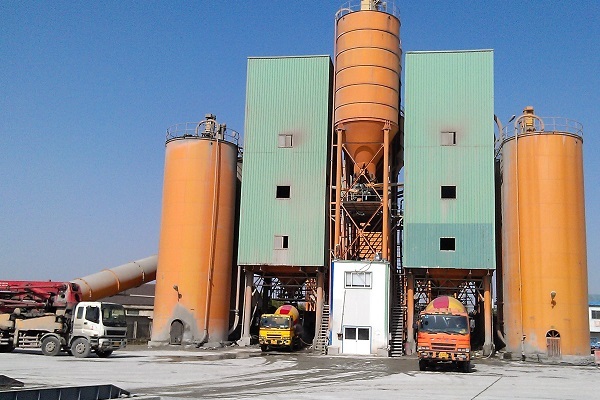 Longwu concrete mixing plant was established by leasing Shanghai Yafu Cement Products Co., Ltd. (located on 3000 Longwu Road,), a subsidiary under the Group in March 2011, in an attempt to effectively manage and utilise resources in Shanghai. With a site area of 14,076 m2, Longwu concrete mixing plant has two 2 m3 mixers, 20 mixer trucks, one 37m truck-mounted boom pump and one 45m truck-mounted boom pump. The plant covers most of the areas in Minhang District, Xuhui District, Fengxian District and Songjiang District. The silo terminal was completed and commenced production in 2001, and had stored a cumulative amount of 2.97 million tonnes of quality high strength cement in transit by the end of 2012. It was awarded “Advanced Enterprise for Building Materials Application (bulk cement marketing) in Shanghai” by Shanghai Municipal Commission of Construction and Administration in 2002. Due to the World Expo, the silo terminal was relocated to Lot 101 of Longwu branch company of Shanghai International Port (Group) Co., Ltd. on 3010 Longwu Road, Wujing Town, Minhang District in April 2007. With a site area of 4,320 m2, the silo terminal comprises one reinforced concrete silo with a capacity of 10,000 tonnes cement and one steel panel silo with a capacity of 3,000 tonnes cement. It has the transit capacity of 400,000 tonnes of quality high strength cement each year.